Welcome to the world of Carbon Farming. Leading farmers and agronomists are searching for better ways to manage land for higher production and healthier profits, as well as a buffer against Climate Change. Soil Health is widely recognised as the key to these benefits, and Soil Carbon - that complex substance that is made when CO2 is drawn down from the atmosphere by plants and trees - is key to Soil Health. Soil Carbon is simple and easy to grow. Just do good, old fashioned things for the soil, like feeding it and keeping it covered to stop erosion and encourage microbes. 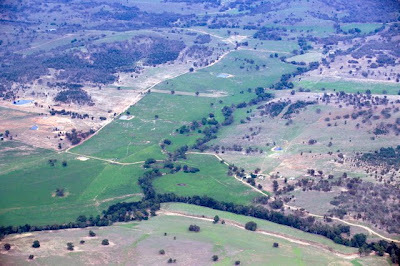 There is a a rapidly growing array of options for land management practices that encourage soil carbon. We call it Carbon Farming and after 5 years working with Carbon Farmers all around the world, we saw the need for a useful book about what we have discovered. CARBON FARMING is NOT a silver bullet for all your problems. It IS a new way of thinking about land management. It focusses on SOIL CARBON as a single indicator of success. No sane person could disagree: if you are growing your soil carbon, you are doing the right things for your soil. Soil carbon is its own reward. You enjoy growing it, maintaining it, enjoying the benefits it brings, including healthier soil, better water usage, higher productivity and... potentially ... CARBON CREDITS. That's right. Farmers geting paid good money to farm in a way that improves their chance of surviving Climate Change. 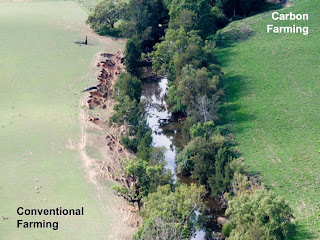 The Minister for Agriculture Tony Burke is on record as saying that if you sequester carbon in your soil 'you get cash'. The Carbon Farming Handbook is the Beginner’s Best Friend. It is the ideal introduction to the subject. Easy to read and understand, it takes you through each stage a step at a time. The Carbon Farming Handbook is about what works, not just theoretically, but really, on the ground on the farm. For instance, the photo of the river that appears here is our property "Uamby:" in Central West New South Wales. The only difference between the two sides of the river is TIME. I mean by that the time that animals were allowed to graze on each piece of ground.One side saw the sheep for more than 200 days. The other side might see them 30 days in total. That is how you grow carbon in soil. The CARBON FARMING HANDBOOK tells you how. (This time management of grazing was taught to us by Allan Savory of Holistic Management fame. We are in his debt.) It is one of the many practices Carbon farmers can choose from. The CARBON FARMING HANDBOOK lists and explains them. • What is Soil Carbon? • Soil Organic Matter – why is it important? • Soil Organic Carbon – how do you grow it? • What is Carbon Farming? • How is it different? • Which are the Best Microbes for growing Carbon? • How can you encourage them? • Why Is Everyone talking About Soil Biology? • How do you interpret your soil tests to find how many tonnes of carbon you have captured? 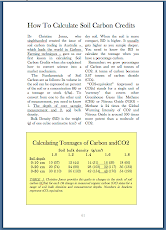 • How do you Calculate Soil Carbon Credits? 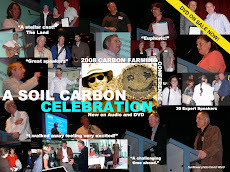 • How do you sell your soil carbon? • How much could you to get for it? PURE GOLD! RICH, FRIABLE SOIL, MICROBIALLY-ACTIVE TOPSOIL. CARBON-RICH, HIGHLY-PRODUCTIVE, DROUGHT-RESISTANT SOIL. There is a lot of debate and confusion soil carbon. 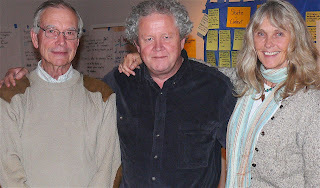 The only experts on Carbon Farming and Soil Carbon Trading are the people who are doing it. When you read the Carbon Farming Handbook, you can be sure that you are getting facts from the people who practice Carbon Farming.